Leeds developers Citu has been nominated for a prestigious art award for a unique 200m-long mural, commissioned as part of a ground-breaking urban development in Sheffield. The unique KurbArt project forms a visual partition on the Little Kelham development in the city’s Kelham Island district, which has been shortlisted for the Keith Hayman Award for public art, part of the Sheffield Design Awards. Citu marketing director Kev Gillespie said: “Before we started out with KurbArt we were as guilty as everyone else putting up less-than-inspiring boundaries to our developments. We had boring poster boards all along a 200-meter wall that formed the boundary of Little Kelham, but we quickly realised no-one wants to walk to work, reading about houses for sale. 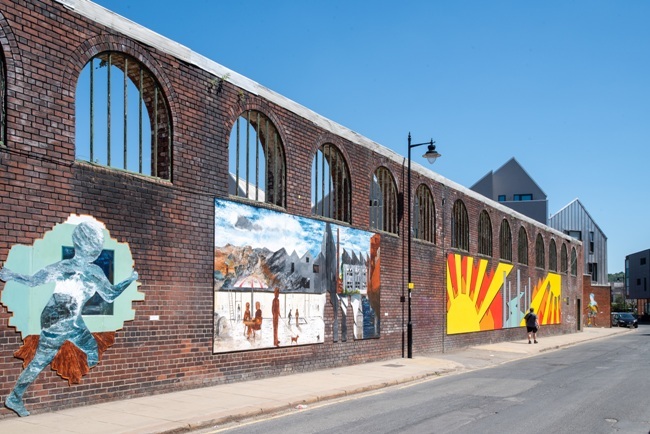 Citu approached the Kelham Island Arts Collective (KIAC) and asked them to transform the 200m brick wall into “something amazing” that captured what Kelham Island was all about, and what it means to the people living there. KurbArt – standing for the Kelham Urban Art Gallery – consists of a series of large-scale works that hang on the long exterior wall of Little Kelham, each accompanied by a title/artist card. There are now 13 separate works by 5 different artists, ranging in size from 3mx5m to 3mx20m. The murals draw on common themes but differ in shape, colour palette, material and style. In adopting the urban art gallery approach it allows each piece to appeal in its own right, as well as contribute to a wider engaging vista but in a very urban setting. The biennial Sheffield Design Awards and the Keith Hayman Award are organised by The Sheffield Society of Architects and Sheffield Civic Trust. The Awards, now in their tenth year, celebrate buildings, open spaces and public art which have a high design quality, make a substantial contribution to the local environment and encourage the preservation, development and improvement of features of historic or public interest within the Sheffield City Region. The winners are due to be announced later this month.